Anyone know here I can obtain new Pirelli P-Zero Corsa LSs for the rear of my Evora? 275 / 30 x 20. Lovely tyres but quite a soft compound. Alternative is an all-round replacement with Michelin Pilot Sport 4Ss, which seems a bit of a shame 'cause the front Pirellis have loads of life left in them yet. I changed to michelin. I think its a better tyre. As much, if not more grip yet they last quite a lot longer, particularly the inside edge. I got mine from Camskills but they're out of stock so no use to you right now. I intend to change to the Michelin's next time though as Chris has done. 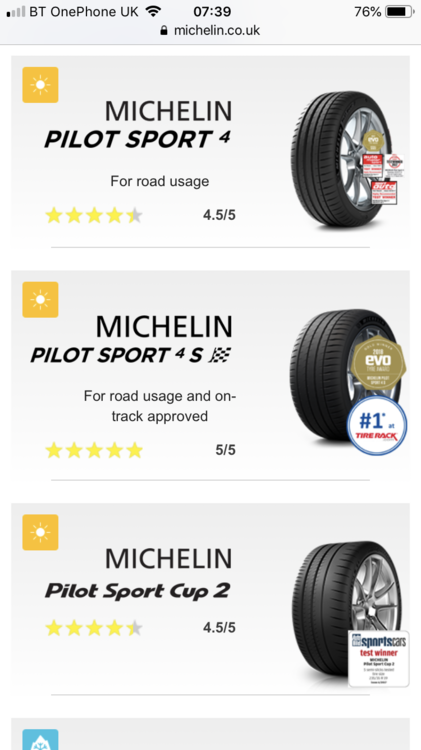 Why is it that the Michelin PS4 such a recommendation has no other tyres been tried ? 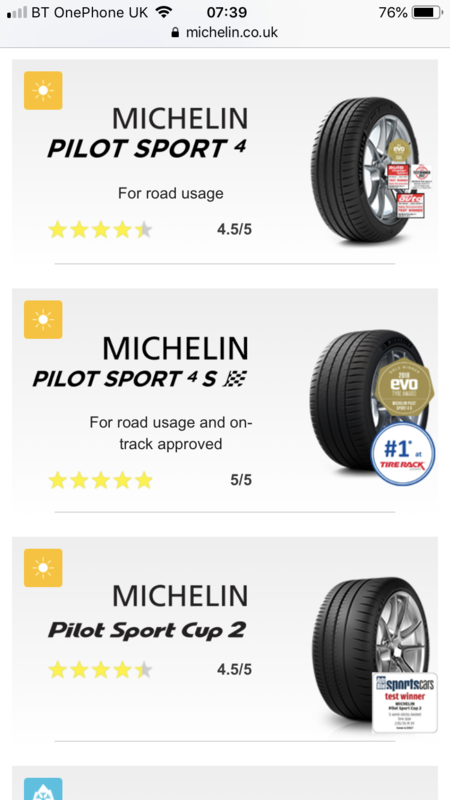 I assume the PS4 are good tyres but there must be other alternative tyres which are good if not better ? Reading some Elise drivers they seem to favour Yokohama I just wondered would that brand not extend to Evora ? i will need a couple of front tyres by summer I expect , can I mix PS4s with Pirelli’s ? Probably because the Michelins are now the standard fit on all new Evoras. Ok thanks, good recommendation. And even if I could find the Pirellis, I reckon they'd be quite pricey anyway, so a full set of four PS4 might not work out much more expensive (ha - I've talked meself into it!). Make sure you get the right ones. Ps4 is for moderate performance saloons etc, ps4s is for sport cars. I also went up a width on the front and back to give a little rim protection. I’ve had no problem with rubbing. If you are doing low mileage summer driving then you could go for cup 2. It’s what lotus fit on the 430. So it’s seems the PS4 S is to way to go I am never likely to see a track and so my car is only weekend and school run about 6-7k max a year. would PS4 S still be ok ? Also my current 225/40 Pirelli is it case to go for extra width as I like thought to protect the rims ?